Derby's waste - a rubbish blog ! : Permit to fly ? 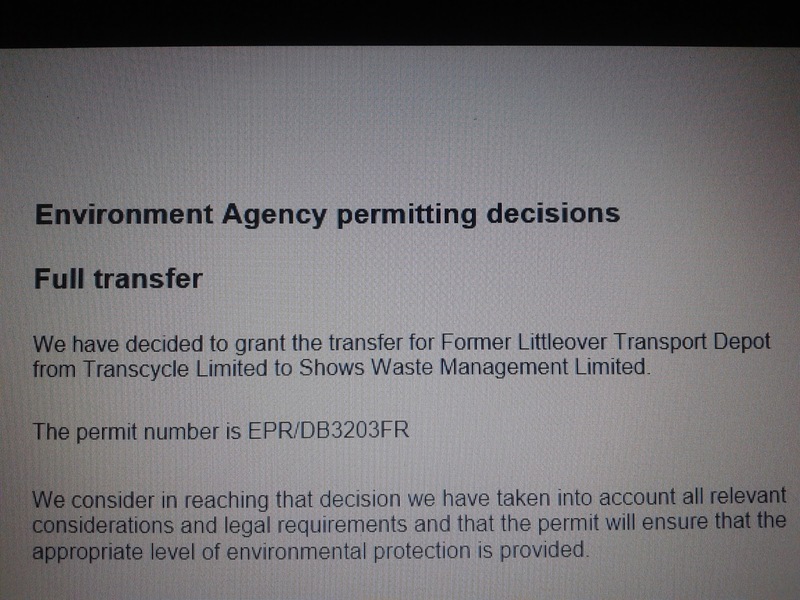 "IN REACHING THE DECISION WE HAVE TAKEN INTO ACCOUNT ALL RELEVANT CONSIDERATIONS AND LEGAL REQUIREMENTS AND THAT THE PERMIT WILL ENSURE THAT THE APPROPRIATE LEVEL OF ENVIRONMENTAL PROTECTION IS PROVIDED"
So stated the decision notice issued by the Environment Agency when transferring the waste permit for 201 Slack lane from Transcycle to Shows Waste Management. If EVER we needed an example of a statement not worth the paper it was written on it would have to be this statement when judged against the horrific fly infestation from the site which months later would overwhelm the community of Mackworth and New Zealand in Derby UK. Reports suggest that the site was home to up to 5,000 tonnes of waste at the time news of the fly infestation hit the media and similar tonnages were confirmed at the public meeting held on 6th June which the sites owner attended. 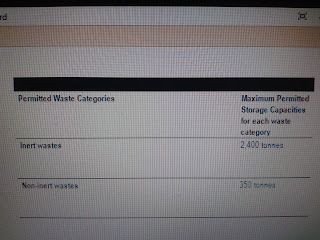 BUT HOW MUCH WAS THE SITE PERMITTED TO HOUSE VIA THE SITES WASTE PERMIT - WHICH WAS TRANSFERED TO SHOWS WASTE MANAGEMENT? NON INERT waste is not defined in the permit but should be taken to be the opposite definition to that shown for inert waste. 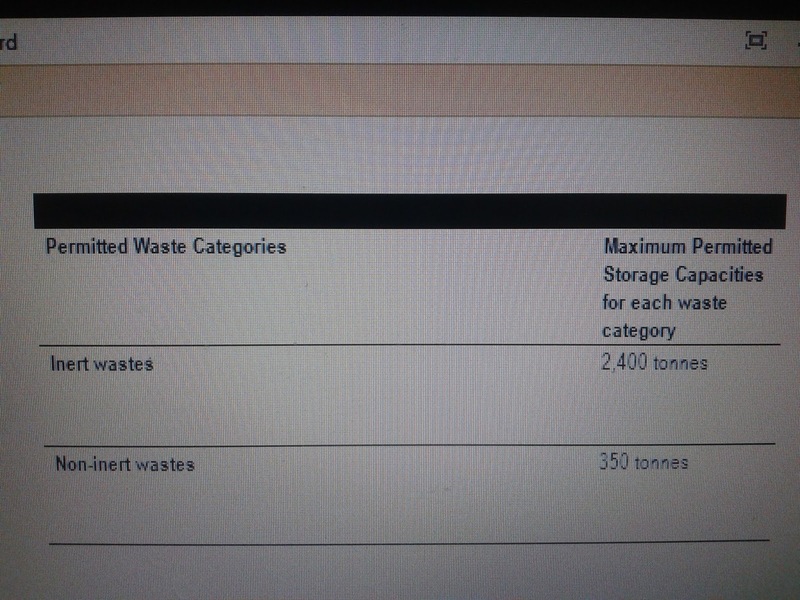 Now even before considering if the material that has caused the smell and fly infestation is inert or not with a combined total tonnage of 2,750 tonnes of waste acceptable to be housed on site Shows Waste Management has completely failed to meet its permit targets and requirements - noting previous suggestions that the site held up to 5,000 tonnes. Now if we are to consider that the material COULD be non inert waste then it is clear that the company in question as license holder has completely failed to meet its duties as a responsible waste management facility. Even if considered inert Shows Waste Management has failed the community it is housed in and must face robust action by the authorities. Talking of robust action the permit comes across as being a robust instrument for controlling the waste site. "Treatment for disposal of no more than 50 tonnes per day"
"Quantities of waste stored on site shall not exceed the maximum permitted storage capacities"
f notifications to the Agency." · stored in bays provided with an impermeable pavement and sealed drainage. ii) These wastes shall be subject to monitoring in accordance with condition 5.2 and shall in any case not be stored for longer than 48 hours, unless otherwise agreed in writing with the Agency." 5.2.1 Measures shall be implemented and maintained throughout the operational life of the site to control and monitor emissions of odours from the site, in accordance with the standards specified in Table 5.2. 5.2.2 All emissions to air from the specified waste management operations on the site shall be free from odours at levels as are likely to cause pollution of the environment or harm to human health or serious detriment to the amenity of the locality outside the site boundary, as perceived by an authorised officer of the Agency." 5.3..1 Measures shall be implemented and maintained throughout the operational life of the site to control and monitor the presence of pests on the site, in accordance with the standards specified in Table 5.3. The objective of these measures shall be to prevent pest infestations that are likely to cause pollution of the environment or harm to human health or serious detriment to the amenity of the locality." Prohibits under penalty the deposit, treatment, keeping or disposal of controlled waste in or on any land otherwise than in accordance with the terms of a Waste Management Licence. Non compliance with any licence condition may lead to prosecution under this Section. A person who contravenes Section 33 subsection (1) shall, subject to subsection (7), be guilty of an offence and liable on summary conviction to imprisonment for a term not exceeding 6 (six) months or a fine not exceeding £20,000 (at the date of issue of this licence) or both, or on conviction on indictment, to imprisonment for a term not exceeding 2 (two) years or a fine or both, or in relation to special waste for a term not exceeding 5 (five) years or a fine or both. Places a duty on any person who imports, produces, carries, keeps, treats or disposes of controlled waste to take all such measures applicable to him or her as are reasonable in the circumstances to prevent any other person contravening Section 33, and to prevent the escape of waste from his control or that of any other person and, on the transfer of the waste, to ensure that it is only to an authorised person, or to a person for authorised transport purposes, and that a written description is transferred with it. A person who contravenes Section 34 subsection (1) shall be guilty of an offence and liable on summary conviction to a fine not exceeding £5,000 (at the date of issue of this licence) or on conviction on indictment to a fine. 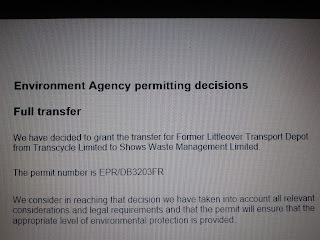 If the licence holder wishes to transfer the licence to another person ("the transferee,") the licence holder and the transferee shall jointly make an application to the Environment Agency (enclosing the prescribed fee). The Agency will not effect the transfer unless it is satisfied that the transferee is a Fit and Proper Person. The Environment Agency is empowered to require the removal of any controlled waste deposited in breach of Section 33(1), or to require the undertaking of such works as are required to reduce or eliminate the consequences of such deposits. SO WITH ALL THIS IN MIND HOW HAS THE WASTE SITE IN MACKWORTH DERBY BEEN ABLE TO DEVELOP INTO A SITUATION WHERE WASTE WAS ABLE TO BUILD UP AND BECOME A BREEDING GROUND FOR PLAGUES OF FLIES THAT WENT ON TO BLIGHT A WHOLE COMMUNITY? Have you shared this with the good people at the Avonmouth Dust Forum?